Looking for a long weekend packed with acrobatics, handstand, playful movement and good company? Juampi and Sytske are joining forces to turn you upside down. This 3 day retreat is intended for intermediate acro practitioners. You will refine your solo handstand, work on hand to hand, learn creative ways of balancing on eachother and move gracefully through acro transitions. Each day will be well-balanced with a targeted warm-up to ignite your core and prepare your body in a smart way. 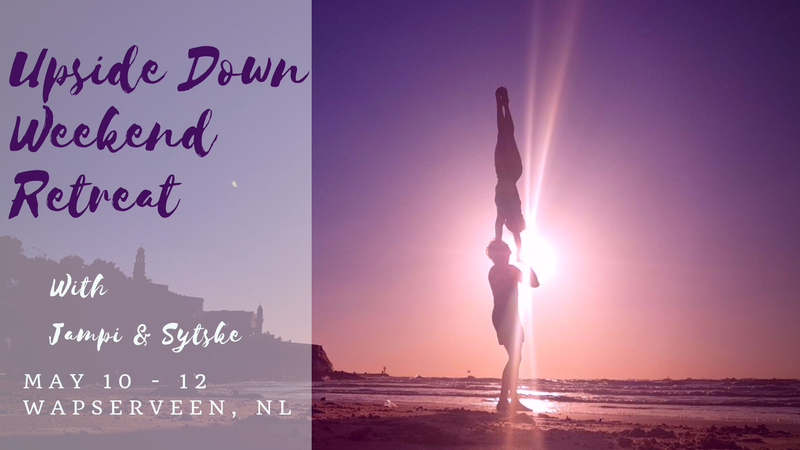 In the handstand workshops you will learn to improve your handstand alignment and balance. In the acro workshops we will take it to the next level: balance together! Expect to work on Hand to Hand, L-basing transitions and funky inversions in different basing positions. To give our bodies & minds some well-deserved relaxation, we will guide you through some yummy massage sequences, have some restorative movement practices and take walks in the beautiful nature around us. The fees include accommodation and food, so everything is set! Our favorite cook Maaike will be there again, treating us with her fairytale creations. The food is organic, vegetarian and with vegan options.